Coir matting is a traditional natural doormat made from coconut husk fibres. Coarse fibres are renowned for being used as coir door mats due to their dirt-scraping properties. Coir matting is bonded to a heavy-duty PVC anti-slip backing for minimum movement. Can be printed to create logomats. Please contact us for more details. Pile material: coconut husk fibres. Our coir matting range is manufactured from coconut husk fibres which effectively scrapes dirt from footwear, helping to keep internal floors clean. There are four different colour options available; natural, black, dark brown and grey. Each colour option is available in a variety of sizes, suitable for offices and commercial buildings. Bespoke sizes of coir matting can also be requested to produce individual coir door mats. Coir matting can be installed into matwells or laid to surface with a heavy duty PVC backing. 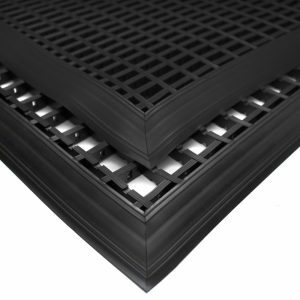 The PVC backing prevents coir matting from moving around and keeps it securely in place. We recommend installing mats indoor for optimum performance. There is also the option to personalise your coir matting with a printed logo. A personalised mat is ideal for creating a positive first impression. See our full range of entrance mats.